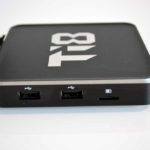 I’ve gotten a lot of requests to review the EZ-Stream Ti8 Android box over the past few weeks. In fact, I’ve gotten so many that I thought on doing an “Honest Trailers” style intro for this article. 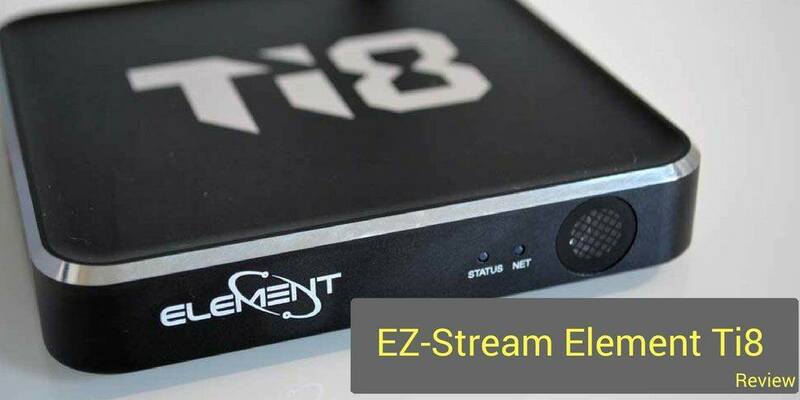 So I reached out to the team at Element Technologies (who changed their name to E-Z Stream recently) to see if I could get my hands on one of their new EZ-Stream Ti8 fully loaded Kodi boxes to test out, and they were happy to help out. This device has been so popular with everyone reading, I was really looking forward to putting the EZ-Stream Ti8 through it’s paces. How did it do? Stay tuned and read on! Element Technologies is based here in Orlando, Florida. Since the Android box community here in Orlando is actually pretty small, it turns out that some of the founders are actually friends with the guys over at SkyStream. What’s cool about that is that you’ll actually see a lot of common threads in how the two companies take care of their customers. Instead of backstabbing each other, they both want to make the best products they can. For example, Element puts the same focus on having a great customer support team and service after the sale. Their customer service team is based here in Florida and has several options how you can reach them. For the self-service crowd, there is an online knowledge base, with several in-depth video tutorials, like the EZ-Stream Ti8 setup video below. There’s also a Facebook support group where you can get support from users and team-members for your issue. If you’d prefer to talk to someone in person, you can call their toll-free support number anytime M-F, 9-5. Of course, there’s also an option for email if those times aren’t convenient. One important note: Even though Kodi is a huge part of the EZ-Stream Ti8, the company is not affiliated with Team Kodi in any way. Any addons that are included with the Ti8 are not owned or maintained by Team Kodi. The EZ-Stream Ti8 used one of the new AmLogic S912 chipsets which improves on the wildly popular S905 CPU. 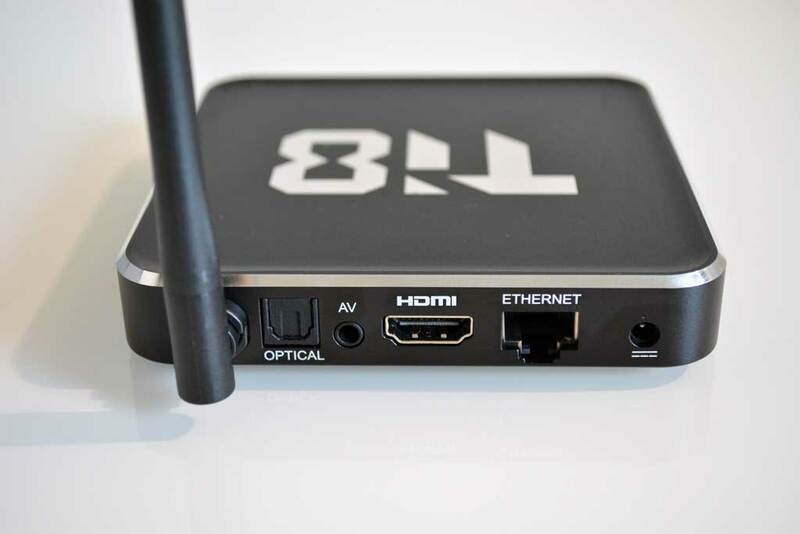 AmLogic is one of the most popular Android box chipsets, especially for manufacturers who want the best performance with video playback in Kodi. Beyond that, the specs are pretty standard. 2GB of RAM and 16GB of internal storage as well as 802.11 ac Wi-Fi. One of the pluses of using the AmLogic S912 is that it supports Android 6.0 Marshmallow. While no device lasts forever, this means the EZ-Stream Ti8 will be “future proof” for at least a few years. Some of the things that are missing though are USB 3.0 and Gigabit Ethernet. Personally, I can live without Gigabit Ethernet, but I find not having USB 3.0 limits my options for plugging in external hard drives. I realize that designing hardware specs is often a game of give and take. Hardware manufacturers always have to make choices based on what the feel is best for their customers. I just with that more designers would include USB 3.0. 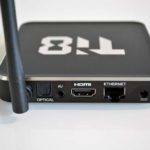 The EZ-Stream Ti8 is a really compact Android box, about the size of a Beelink Mini. Unlike the Beelink, the Ti8 has a more sophisticated, less generic feel to it. The corners are rounded off, and there is a polished metal edging along the top of the device. All of the venting is on the bottom of the device and the Wi-Fi remote is permanently attached on the back of the box. On the front of the box there are two small status lights: one for power and one showing network activity. Next to those lights there’s a fairly large IR remote receiver that blends in to the frame unless the light hits it just the right way. One of the things I liked about the box is that all of the USB ports are on the left side of the device, when you’re looking at it from the front. Some devices split the USB ports on the side and the back, but I never really liked that configuration. I always found myself using the side ports almost exclusively. The ports on the back always felt crowded and wedged in between the HDMI cable, power or digital optical cables. The Ti8 gets around that by moving all of the USB ports to the side. 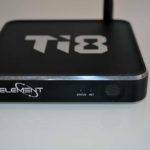 The remote control bundled with the Element Ti8 suffers from the same shortcomings as a lot of other manufacturers. It just doesn’t feel good in your hands. To be fair, the remote I received with my Ti8 was the basic remote – no air mouse functionality. Let’s get back to this particular remote. It’s got a double-circle directional pad, which sits right at where your thumb would naturally rest. Above that are the volume up and down buttons, which, oddly enough, don’t use the standard icons that we’re all familiar with. Instead they elected to go with “V-” and “V+” labels. The mute button at the very top right goes back to the icon though. From a user-interface perspective, it feels a bit disjointed. Underneath the D-pad are the Menu and Home buttons and a Back button – all fairly standard issue for Android based remote controls. At the very bottom is a number pad. 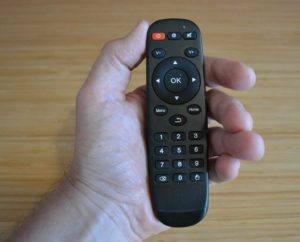 As you can see in the picture, the remote feels small and tended to get lost in my hand when I picked it up. It’s fairly light once the batteries are installed, but that doesn’t mean it’s comfortable to hold. 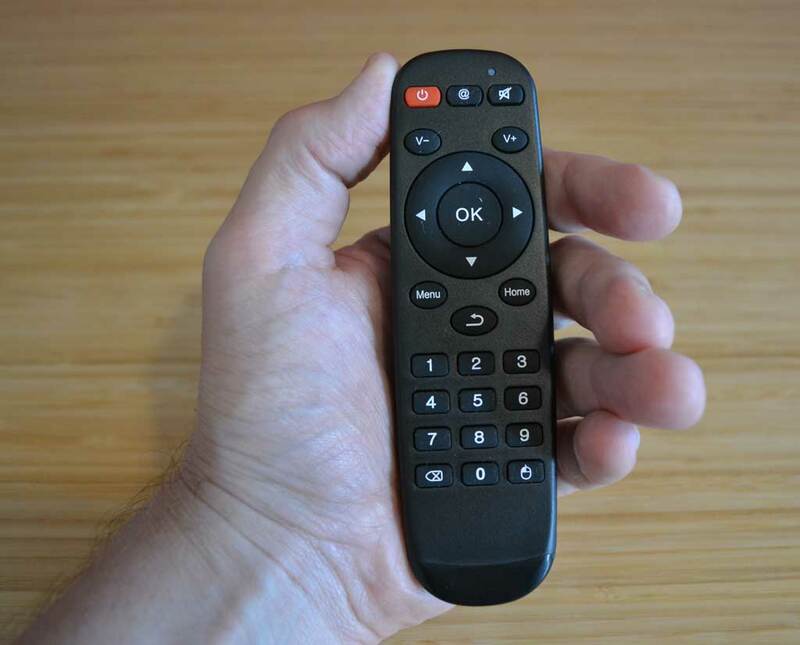 The back of the remote is smooth, polished plastic, so there’s no ergonomic texturing to keep it from sliding around. Overall, this remote will get the job done. I get the impression that they needed to include something and this was good enough for basic use. For an extra $20 you can upgrade to the air-mouse version which looks much higher quality. Or, if you prefer, you can check out my recommendations for aftermarket air-mice or HTPC keyboards. Once you boot it up for the first time, the Android 6.0 launcher in the EZ-Stream Ti8 has a familiar feel to it. In fact, most device manufacturers have been using something similar for several years now. And for good reasons. The large, flat-design icons make it easy to navigate around the interface and find what you’re looking for. 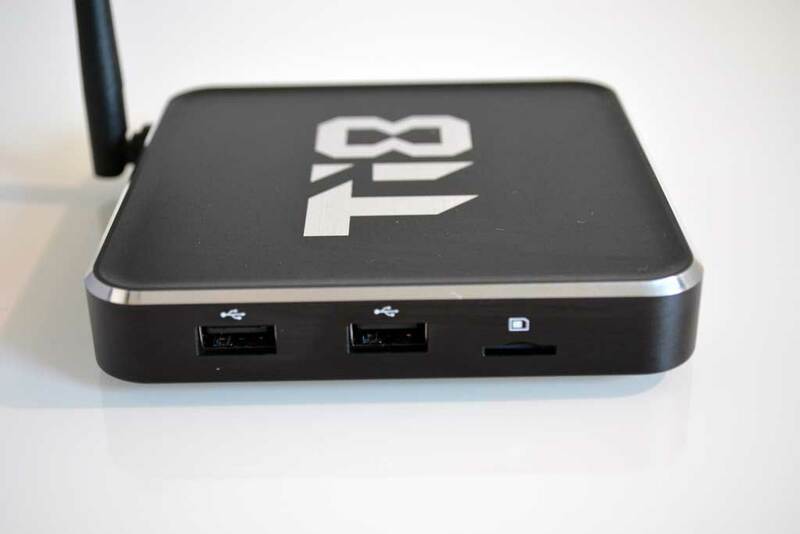 The box is built for streaming, and not just for Kodi. 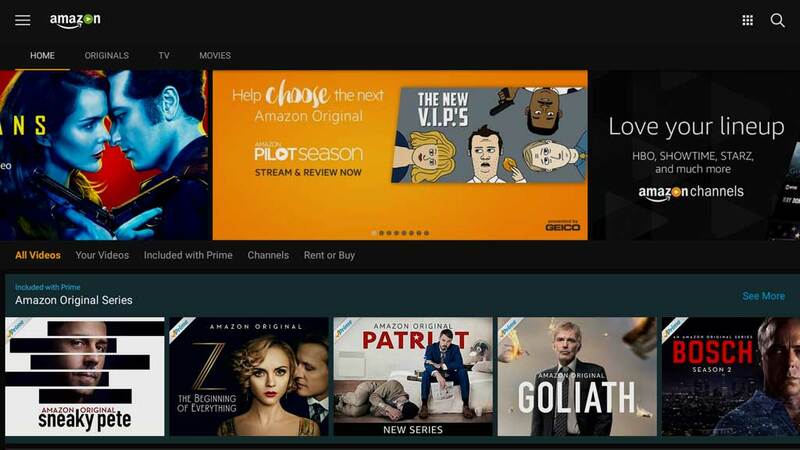 Along the bottom row is a configurable list of one button shortcuts to launch Amazon Prime video, Netflix, Mobdro and several others. If your favorite isn’t included, you can always add it after the fact using the large “Plus Sign” icon on the right side of that row. But if Kodi is your thing, then you’ll want to jump right in. But…there’s one thing you should do first. 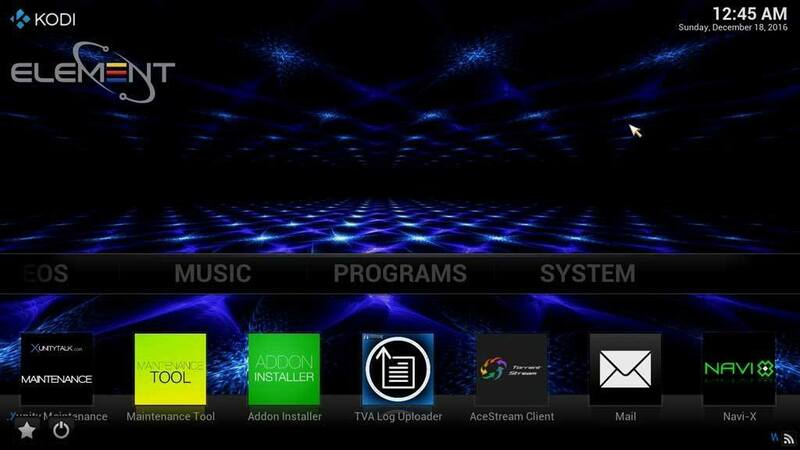 The E-Z Stream Updater is how the EZ-Stream Ti8 gets its access to all of the latest Kodi add-ons. More importantly, its how it keeps them updated to limit the number of dead addons out there. There’s nothing worse than dead add-ons, right? You see, because of the way that streaming is legislated around the world, the EZ-Stream Ti8 doesn’t ship with all of the Kodi addons pre-installed. Depending on the country you live in, this could get the guys at Element Technologies into some legal hot-water. So they do the next best thing: they include a one-click way so that you can choose to install the addons after purchase if you want to. The E-Z Stream Updater will check to see if there are any updates for the system as well, which is something I strongly recommend everyone do from time to time. Not only is this going to keep your streams updated, but it will make sure you get any security updates as well. Once you run the EZ-Stream Updater, it will automatically launch Kodi and you’ll see all of the addons loaded along the bottom row. 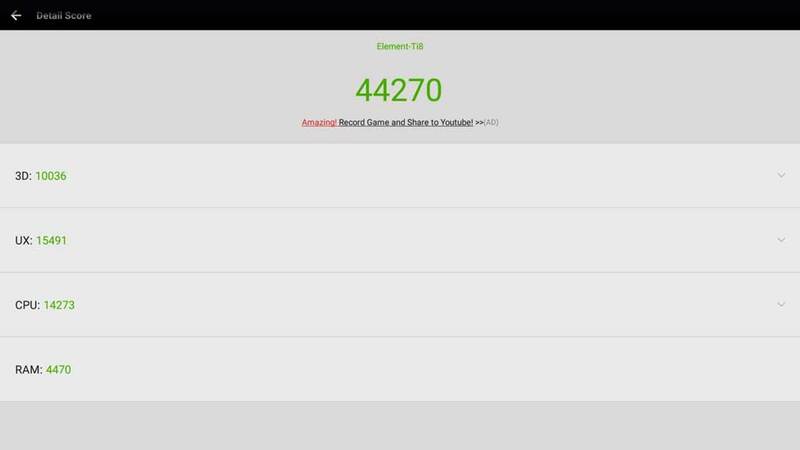 Some of the first tests that I to run on a new Android box are some of the more popular stock benchmarks like AnTuTu and Futuremark’s Ice Storm. The same videos that other devices struggled to hit 30 frames per second on, the EZ-Stream Ti8 was pushing 45 frames per second. Benchmarks are not the be-all, end-all of testing a new product. There are some people that put complete faith in a benchmark score. They’ll sit and tweak a device just to get that score a couple of points higher. I’m not one of those people though. Basically, I recommend looking at benchmarks a bit more broadly. The trouble is that benchmarks don’t necessarily translate into real-world performance. 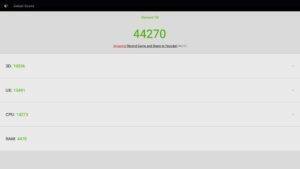 If you’ve got a device that scores 34000 on AnTuTu and one that scores 35000, there’s not going to be a whole heck of a lot of noticeable difference. 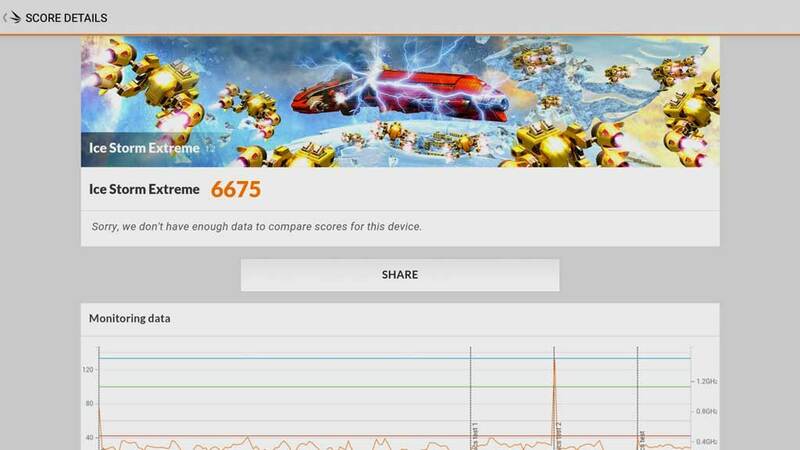 What if you’ve got one device that outscores the other by almost 6000 points? Well, that might be worth talking about. That’s exactly what the Element Ti8 did. 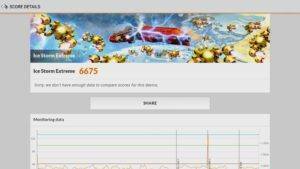 It scored a very impressive 44,270 AnTuTu score which outscored the MINIX NEO U1 by a wide margin. With that kind of performance, I was really interested in seeing how it performed on my favourite graphics benchmark from Futuremark. Normally most of the latest crop of Android boxes are able to run through Ice Store Extreme at between 20-30 frames per second. To give you a frame of reference, the human eye considers fluid motion to be around 30 frames per second. There are several different components to the Ice Storm test – each abusing the system’s graphics processor in slightly different ways. Normally I see whatever device I’m testing start to choke up on one or more of the tests. Like I said, these benchmarks are designed to abuse the system. But the Element Ti8 surprised me by breezing through the benchmark tests. 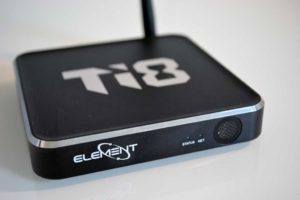 The same videos that other devices struggled to hit 30 frames per second on, the Element Ti8 was pushing 45 frames per second. Pretty impressive! All in all, it ended up with a final score of 6,675 on Ice Storm Extreme – which is over 50% better than the NEO U1’s 4,317. I don’t know about you, but I’m going to consider that a success. Benchmarks are all fine and dandy, but how does the EZ-Stream Ti8 handle real video playback? I did extensive research on four of the main streaming services: Kodi, Plex, Netflix and Amazon Prime Video. OK, you got me. I watched a lot of movies. Either way you say it, I’m going to tell you what I found. I mentioned the E-Z Stream Updater earlier. It’s the heart of the Kodi installation. I had no trouble playing several 1080p and 720p files. Streaming videos worked well too. There were some issues playing 4K video files. There were several sample files on my local network which the Element Ti8 could not play without stuttering. The file sizes were extremely large, so network traffic could be an issue though. If you have a lot of 4K video files that you want to play, Kodi may not be the answer. 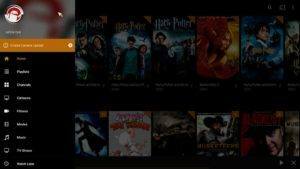 Plex worked flawlessly for both locally stored files and remote streams. Even the 4K video files that Kodi seemed to have issues with, Plex handled easily. It’s worth mentioning that my Plex Server is a Windows 10 PC with an Intel Core i7 and 16GB of RAM. So the server is definitely no slouch. The PC is built to be a number-cruncher, so transcoding is a piece of cake. Still, the interface was snappy and responsive and there seemed to be no lag at all in video playback. 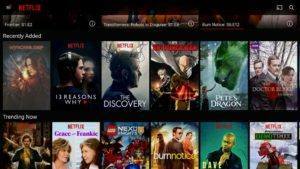 Netflix on the Element Ti8 suffers from the same limitations as most of the other Android boxes: Netflix’s stringent certification rules. You see, Netflix limits many devices to standard definition playback, unless the manufacturer meets their certification standards. 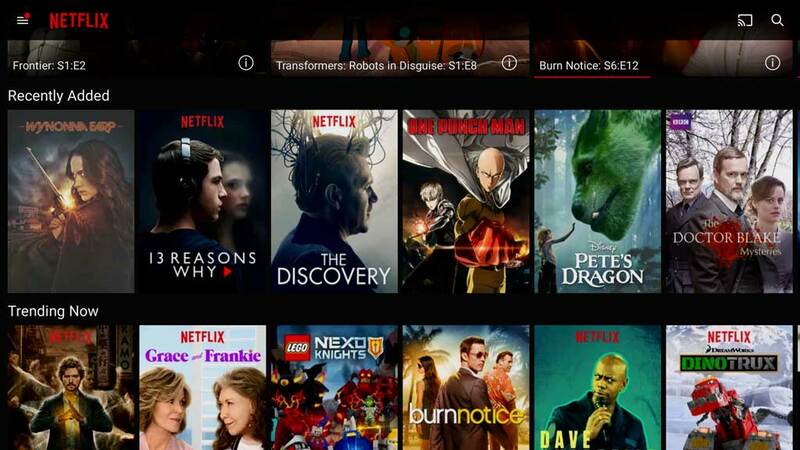 More often than not, many great manufacturers find themselves on the wrong end of Netflix’s rules for no good reason at all. There’s a Netflix HD app included, but it was very clunky to use and the videos definitely didn’t look 4K or even 1080p. The app performed well and streamed the shows I selected almost instantly. But the resolution was disappointing. 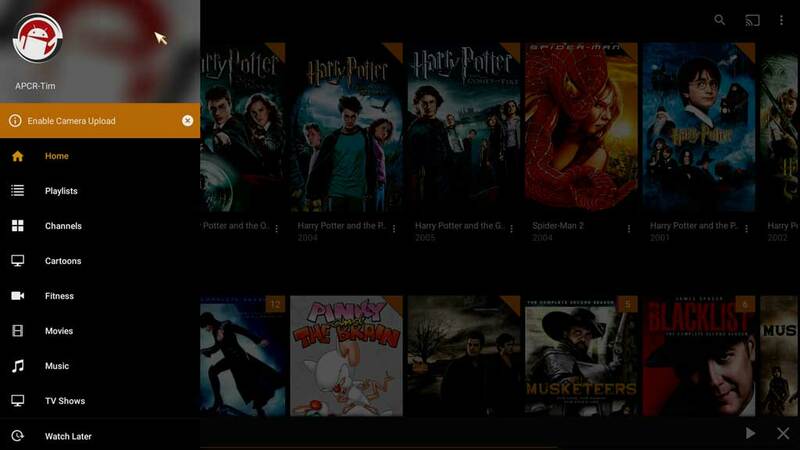 Amazon Prime Video doesn’t have the video library that Netflix does, but it looks a whole lot better. HD videos streamed instantly and there was no buffering within the video that I ran into. Amazon is putting a lot of money into creating original series like The Grand Tour. 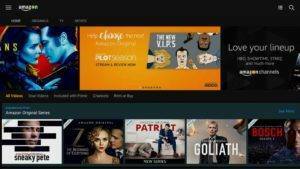 You can also get subscriptions to HBO Now and Showtime through Amazon as well. If you’ve cut the cable cord completely, that may be the only way to (legally) get access to shows like Game of Thrones or Westworld. I’ve got to say that Element looks to have created a really solid piece of tech here. The Ti8 is well designed and looks like something that I would want to display next to my TV, not something that I’d shove underneath in the depths of my entertainment center. No matter what your style is, the EZ-Stream Ti8 shouldn’t look out of place at all. The EZ-Stream Ti8 is a really good streaming device at a good price-point. They’ve got a great support network that will take care of you after the sale, which is critical. 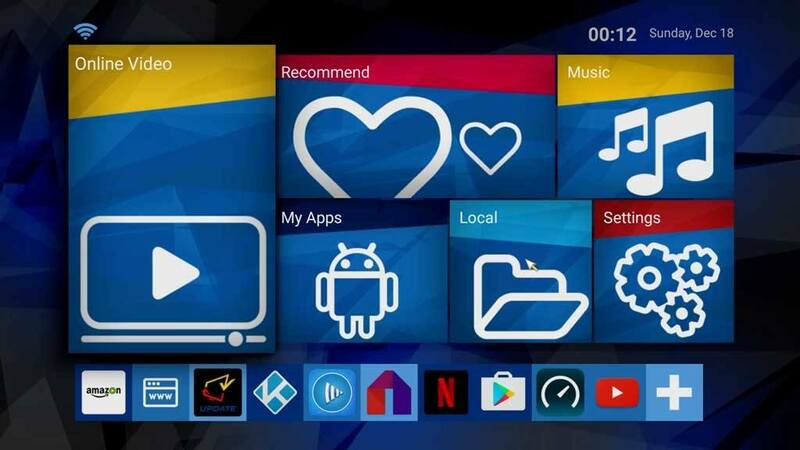 The E-Z Stream Updater keeps the device and the Kodi addons up to date, which takes a lot of the tinkering out of owning a Kodi box. All things considered, this is a great Android box and should be on everyone’s short-list of devices to buy. If you want to find out more about the EZ-Stream Ti8, head on over to EZStreamBox.com. Looks good but my A95X has it all the bells and whistles, except the 912 (905X), but for ½ the price! True, but it’s a different chipset. The S912 gives better overall performance than the S905X. You’re also comparing a generic box to one with a dedicated support team and automatic updates. It may not count as a bell or whistle, but it’s certainly worth a little extra. I bought this box recently, so far I’m satisfied. Not totally impressed tho. I do wish it had included a premium (HD) iptv preinstalled for instance evolution iptv. Seen it on another box was crazy expensive let alone outdated as well. Anyways, so far satisfied at the moment. Any pointer/download anyone can recommend? Skystream one vs element ti8… Who wins? Hi Shaun. I’m going to have to go with the Element Ti8. It’s a newer chipset that outperforms the SkyStream One. There are a lot of similarities between the two, so you can’t go wrong either way. But..in terms of pure performance, the Ti8 has the edge. I was wondering about Netflix support. Does this box offer hd? Also, does it have the option, when setting up Kodi, to set it up for family or adult like the skystream one? I have 3 teens in the house & don’t want them to have access to anything more than R rates movies, & don’t have interest myself either. Hi Bob. I was disappointed in the Netflix support with this box. There is an HD app, but it didn’t look to be HD quality when I tested it out. As for the Kodi setup, the Ti8 uses the same updater as SkyStream, so you can choose “Adult” or “Family-Friendly” setup. Who wouldn’t install all the pirated apps? …people with a few freaking morals, I guess. Ti8 does’nt allow VPlayer for HDMovie App. Do you know how to fix it. I bought Ti8 after reading your article and consider that but I should (at least) reinstall the addons that I have installed on m’y Jynxbox M8 to be totally satisfied. Cannot also install HMA VPN. Thanks for your support. element ti8 vs nividia shield? The Shield TV is in a class of it’s own. That means it is much better? Yes. The Shield is the top of the line. If I don’t game at all, is it still worthwhile to pay the high cost of a Shield? Hi John. I don’t game at all anymore and my Shield TV is still my go-to streaming device. Nothing else has close to the pure hardware power of the Shield TV. You’re paying a premium, no doubt. And for some people, it’s overkill. But it’s worth it IMO. Thanks for the great reviews Tim. 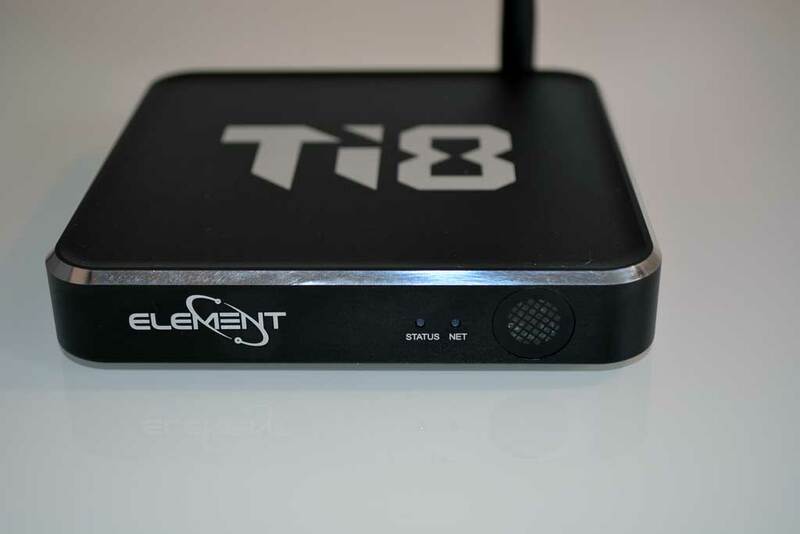 Do you know if the Element Ti8 supports 2TB NTFS external usb hard drives? Considering a $300 R’veal box, but sounds like we need to rethink and check out the Shield? KIds must have Disney and hubby MUST have ALL european soccer. Shield vs R’veal? You can hook up external storage, an HTPC keyboard, flash drive, webcam…really any number of Android compatible accessories. What is the recommended bandwidth to run the Shield or the Ti8 and what is the chip set for the shield ? Hi Charles. Thanks for the comment. It depends on what resolution you want to stream content. I recommend at least 10 Mbps if you want to stream in HD, or up to 20 Mbps is you’re looking for 4K streaming. My article Does Streaming Use Data has more details. The NVIDIA Shield TV has a NVIDIA Tegra X1 processor with a 256-core GPU and 3 GB RAM. I asked one other company the same question and they quoted me 100 mb. I have 25 and was concerned, but what your telling me sounds much more realistic and thanks for your time. It depends on where you’re running the speed test, though. If you’re talking about overall speed coming in to your house, then I’d consider 40+ Mbps to be the minimum, depending on how many streaming devices you have. The 20 Mbps that I was referring to was at each device level. So if you’ve got 2 streaming devices and a couple of computers all wanting the same bandwidth, you’re going to need 40 Mps (20 x 2) for the streamers and probably another 10 Mbps or so for each PC. We’ve got a lot of computers, tablets, smartphones, streaming devices, smart home products, etc., etc. these days. It adds up quickly. One desktop and a couple phones and I barely use my phone. Then you should be ok with 20 Mbps coming in to the house. I would like to use this box for Skype on Kodi…Will my logitec camera work with this devise ? It’s been a while since I tested webcams on Android boxes, but my old Logitech camera did work just fine. I imagine it would depend on your camera and the version of Android running on your box though. It did work with my old box that was running marshmallow 6.0, so I can expect the same here ? If it worked on another Android device, then it should work, yes. does it come with a iptv program for streaming? Element ti8 vs Skystream two? ?